BevStow creates additional storage capacity by horizontally attaching directly under any glass refrigerator shelf. It solves the problem of wine bottles rolling around in the refrigerator or not fitting in the door shelves. The flexible design allows placement under any refrigerator shelf. Sometimes do you play "refrigerator Jenga" by moving items around and piling and leaning them precariously? Finding space for wine and other bottles in the fridge shouldn't require a balancing act. Wine bottles are especially tough because they don't really fit well anywhere in the fridge, and they tip over unless you move other things around to make space. BevStow is a simple solution that makes life just a little bit easier. Whether you're a connoisseur or simply someone who enjoys a chilled glass of Chardonnay in the evening, you'll want one, or more, in your kitchen. BevStow - an innovative, smart solution you can file under, "Why didn't I think of that?" 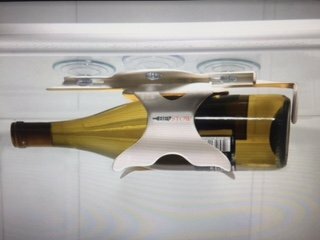 EASY TO INSTALL - Simply suctions to your fridge shelf and remove wine bottle refrigerator rack! If you have any questions about this product by BEVSTOW, contact us by completing and submitting the form below. If you are looking for a specif part number, please include it with your message.